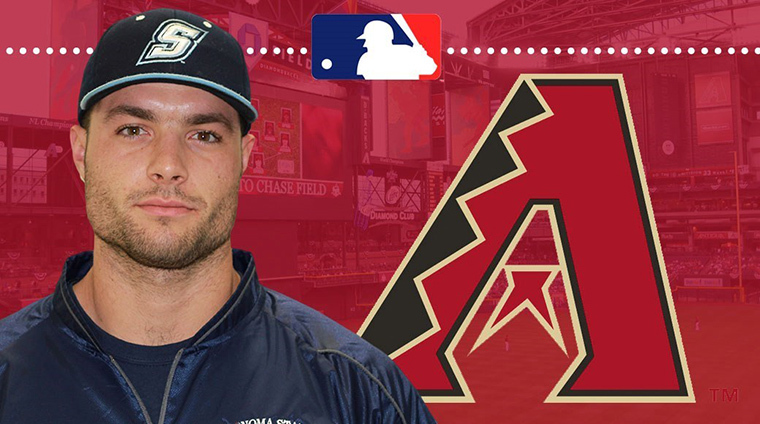 Former Sonoma State University starting pitcher Cal Becker has signed a free agent contract with the Arizona Diamondbacks organization. He becomes the fourth student-athlete on the 2016 team to sign with a Major League Baseball team and the 118th player overall under head coach John Goelz to sign a professional contract after playing at Sonoma State. Becker led the Seawolves with 59 strikeouts in 2016. He went 3-4 with a 4.47 ERA, but was at his best late in the season, when he allowed just one earned run over his final 13 innings while striking out 18. He struck out a team season-high 12 batters in seven innings against Stanislaus State on May 1. Becker joins draftees Ryan O'Malley (Atlanta Braves) and Ryan Luna (Colorado Rockies), as well as Jackson Zarubin (Los Angeles Angels), as 2016 Seawolves to be signed by Major League baseball clubs following the season. Becker becomes the third Sonoma State baseball student-athlete to sign with the Diamondbacks, joining Brandon Burgess (2004) and Joel Thys (2012).